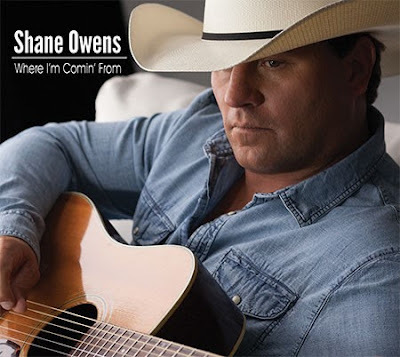 Critics and fans alike have been raving about Shane Owens' highly anticipated debut album, Where I’m Comin’ From, citing the traditional-based artist as one – who like George Jones sang about in his classic song – just might be able to fill the shoes of legends such as “The Possum” and Merle Haggard. The Amerimonte Records recording artist received a ringing endorsement along those lines from Country Music Hall of Fame inductee Randy Travis – who lent his production talents to the album. James Stroud, who produced the album, has blazed trails for country superstars such as Toby Keith, Tim McGraw, Clint Black, Aaron Lewis, Chris Young and many more during his career. Among Stroud’s credits include having produced over 130 No. 1 singles. The new album, Where I’m Comin From, is currently available for pre-order on iTunes and Amazon and will be available for purchase on December 9 in select retailers nationwide through Memphis, Tenn. based distributor, Select-O-Hits. In the past year, Shane Owens has released two nationally promoted music videos which impacted almost every major DMA in the US and also included significant airplay in the UK, Ireland and Europe. Videos are currently available on CMT.com and are currently being aired on The Country Network (33 million households), AXS-TV (45 million households), Great American Country (63 million households) and The Heartland Network (18 million households).